Balloon rides are...Fun, Colorful, Peaceful, Thrilling, Romantic, Awesome, Breathtaking & Unforgettable. But don't take our passenger's words for it. See for yourself. Call today for reservations. Enjoy the Romance, the Adventure, and the Celebration of a beautiful hot air balloon flight with Central Ohio's Premier Hot Air Balloon Company. We offer sunrise and pre-sunset flights, weather permitting. The breeze will majestically usher you through the Central Ohio area, a beautiful panorama of seasonal beauty. Our flights last approximately one hour, but the memories will be life long. All earthbound thoughts and worries are left behind as your balloon escapes the bounds of gravity. A balloon flight will in more ways than any other bring you into the magic of the moment of the present. After the flight you will be driven back to our point of departure. Our balloons and pilots are all certified by the Federal Aviation Administration. Safety is the most important aspect of ballooning and is always the most important consideration. 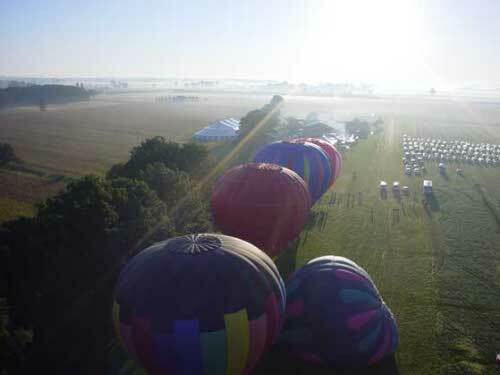 Fly Ohio Ballooning has been operating commercially for over thirty years. We have completed well over a thousand flights and have brought the joy of ballooning to literally thousands of passengers with a perfect safety record. Experience is a must when it comes to passenger safety.